Cook like a pro with the Electric slide-in range free-standing oven from LG. ProBake Convection delivers up to 20% faster cooking vs. LG non-ProBake electric ranges. Inspired by pro-style ranges, this new LG range moved the main heating element from the bottom of the oven to the back wall for optimal heat distribution, so your cookies, cakes, roasts and more are perfectly cooked every time. Cook all your mouthwatering meals and delicious deserts to perfection with this Haier 3.8 cu. ft. free-standing gas range. Its convection oven offers incredibly even results, whatever you're baking, and the continuous cast iron grates across the 5-burner cooktop make it effortless to move heavy pans and griddles around. This all-in-one dual fuel range includes Downdraft, which integrates the ventilation system so a separate hood is not needed. Smoke and odours can be removed outside or filtered air can be recirculated inside. This range allows you to achieve flawless cooking results thanks to Even-Heat True Convection. The unique bow-tie design and convection fan ensure the entire oven is heated perfectly. It also has a steam rack that offers the ability to add moisture to the oven and enhances cooking results. 6.3 cu. ft. Electric Slide-In Range with ProBake Convection and EasyClean in Black Stainless Steel Cook like a pro with the Electric slide-in range free-standing oven from LG. ProBake Convection delivers up to 20% faster cooking vs. LG non-ProBake electric ranges. Inspired by pro-style ranges, this new LG range moved the main heating element from the bottom of the oven to the back wall for optimal heat distribution, so your cookies, cakes, roasts and more are perfectly cooked every time. 6.3 cu. ft. Electric Slide-In Range with ProBake Convection and EasyClean in Black Stainless Steel is rated 4.5 out of 5 by 26. Can I use a cast iron skillet on the cooktop if i check for nothing that would scrap it on the bottom? can the legs be adjusted to change the height if needed? Is the depth the same as a standard free standing stove? I.e. Does it go all the way back to the wall. We appreciate your interest in this Range. The range itself would not have a vent fan that can be activated manually or automatically. Is this product a &quot;Down Draft&quot; exhaust and are there additional pieces required for that type of installation? We appreciate your interest in this range. The raised portion, along the back of the range, is actually the Oven Vent Trim, which is mentioned on page 28 of the owner&rsquo;s manual. This portion cannot be removed from the range. The only thing I see is the price? 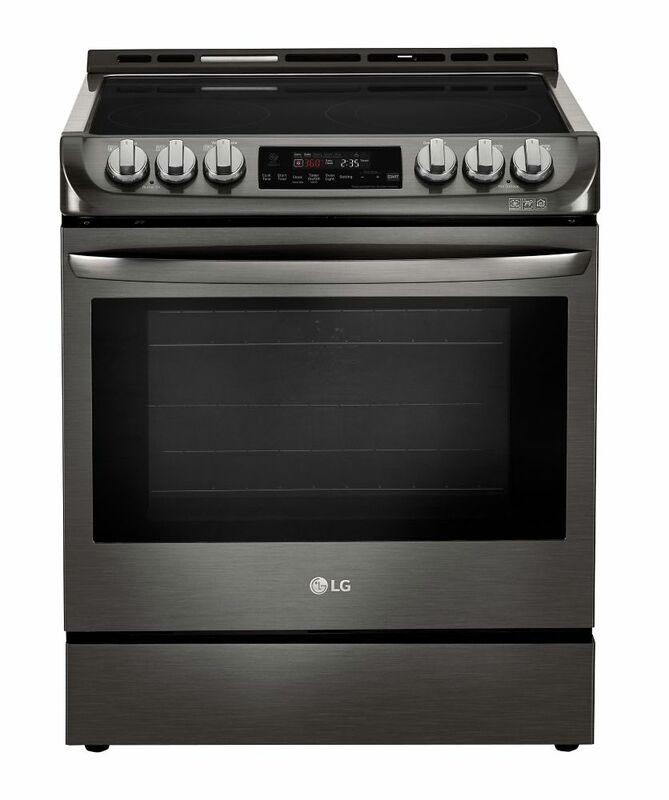 Does LG have any accessories that would fill the gap between the stove and counter? Other slide in ranges extend the cook top over the counter but the LG slide in is much like a conventional stove where it still has a gap.